For the first installment of the newly minted series "Your Style Then and Now," we have a very sassy, confident young Ande Nicoletti. The outfit she is wearing is very Angela Chase, no? 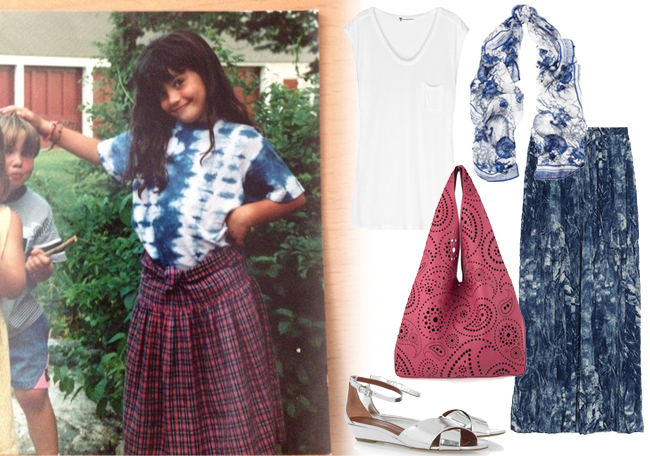 It was kind of tough to recreate in a way that I think Ande would actually wear now (tie dye and plaid together is tough for anyone), but I tried to pick some fun accessories and sandals that are kind of a grown up version of those jelly sandals that we all had back in the day. Ande is my bff Cara's older sister, and that cute little one on the left is their cousin Cam. I'm obsessed with everyone in their family, and I'm sure it's not hard to see why. Really die over that MK skirt and Ande's saucy smile. AMAZING AMAZING AMAZING. I know exactly how fly she was feeling in that outfit and how mean it made her. I know. I want Ande's exact outfit right now. She is stylin!